This is a very simple recipe and it can be applied to any poultry that you like. The reason that we decided to make this dish is because industrially raised chickens have been bred out of all-natural traits. These poor creatures are crammed into dark barns, stuffed with food, bred to grow so quickly that their legs can’t support them and they literally can’t walk. It’s horrific. If I didn’t like meat so much I would be vegan on ethical grounds. The fact that I don’t want to give up meat makes me utterly responsible for making sure that I buy the best that I can afford – choosing higher welfare whenever I can. 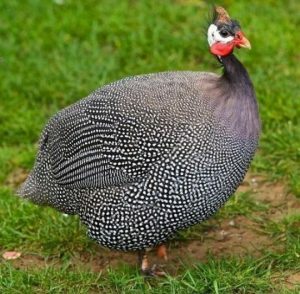 By selecting breeds that aren’t industrially farmed like goose, duck, pheasant, quail, guinea fowl etc. we are adding a variety into our diet that not only helps promote better welfare but we are also increasing the quality of the food and therefore the nutrition. 1 heirloom breed bird – goose, duck, guinea fowl, pheasant etc. Chop the celeriac into chunks of roughly the same size. Boil until a fork goes easily into the pieces. Drain and put in a food processor. Blend until there are no chunks left. Add a couple of tablespoons of heavy cream or butter, ¼ teaspoon of nutmeg and salt to taste. Mix well. Step 1 – Prepare the stuffing Put the sausage meat in a bowl and add the chopped onion and garlic, the dried herbs, pepper, grated cheese (⅓ Pecorino romano and ⅔ Parmigiano Reggiano or Grana Padano). You can do this without egg (it will stay crumbly) or you can add one egg to the mix to keep it together. Optionally you can use the keto “bread crumbs” (crushed pork rinds) or some almond flour if the mix has too much liquid. No need for additional salt, normally. Step 2 – Prepare the guinea fowl Before starting, if you wish, remove (or burn with a flame) any remaining plumes from the guinea fowl. Once done start filling the guinea fowl with the stuffing just prepared. Optional step: create some cavities between the skin and the meat and put some butter under the skin of the bird to increase the fat content and allow for additional flavour. Season the tray with olive oil, dried herbs, salt and pepper and depose the guinea fowl in it. Drizzle the top with a little bit of olive oil and season the top of the bird. As a last touch drizzle a little bit of wine (red, white or rosé) on the bird and especially in the bottom of the tray. A quarter of a glass of wine should be enough. Cover and put in a preheated oven at 180 degrees Celsius for 40 minutes. After this time as elapsed, uncover the guinea fowl, raise the temperature to 210 deg. and let the top of the bird crisp up for 15 minutes or so. 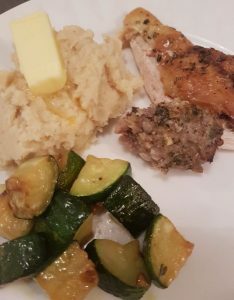 Check if cooked by using a meat thermometer, even though roughly 1 hour overall should suffice (depends on the size of the bird and the amount of stuffing used). Post your pictures on social media and tag #ketochristina or #mrketochristinacooks Buon appetito!